For ages untold, a gemstone monolith has pierced the heart of the Echo Wood. Now, as civilization intrudes upon this enigmatic splinter, a strange life once again stirs in the depths - one with ties to undying evils and a might beyond time itself. The promise of wealth and power calls to glory-seekers from across the Inner Sea region, tempting them into a labyrinth of monster-haunted vaults, defiled tombs, arcane laboratories, and worse, as they seek to unveil the secrets locked below the legendary Emerald Spire. Lethal dungeon levels crafted by the creators of the Pathfinder Roleplaying Game and a host of fantasy gaming's greatest authors and designers. A gazetteer of Fort Inevitable, a bastion of merciless order near the Emerald Spire serving as a base for exploration or a launchpad for more adventures. Insights into the region and plots taking central stage in the upcoming Pathfinder Online massively multiplayer online RPG. A bestiary of the Emerald Spire's myriad monstrous menaces and inscrutable inhabitants. Dozens of new treasures, maps, side-plots, and more! 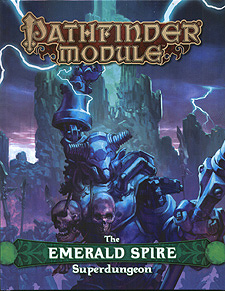 The Emerald Spire Superdungeon is intended for use with the Pathfinder Roleplaying Game and the Pathfinder campaign setting, but can be used in any fantasy game setting.